Pampa Grass (Cortaderia selloana): growing, planting, caring. 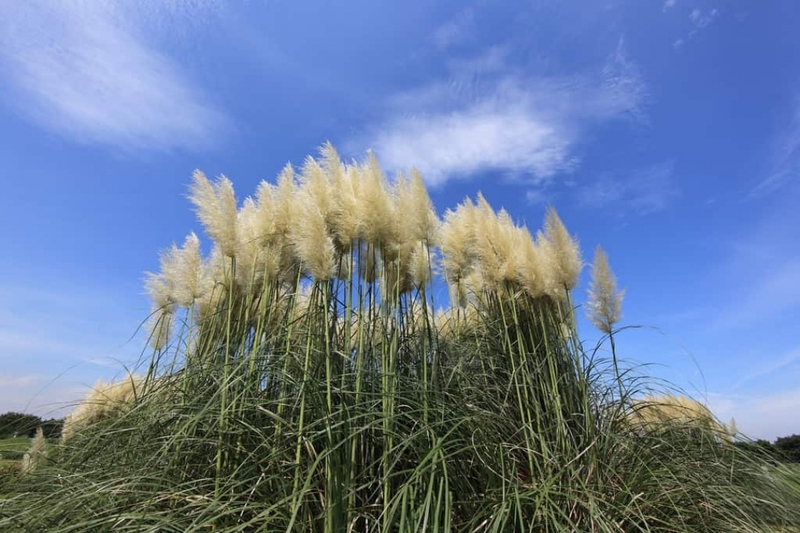 Cortaderia selloana, commonly known as pampas grass is a flowering plant native to southern South America, including the Pampas region after which it is named. There are around 25 species in the genus Cortaderia. This giant grass is popular it is easy to grow and pleases the eye with its decorative giant feather plumes. Pampa grass is a tall grass, growing in dense tussocks that can reach a height of 3 m (10 ft). its leaves are long and slender with very sharp edges, usually bluish-green and sometimes silvery grey. The flowers are produced in a dense white panicle 20–40 cm (8–16 in) long on a 2–3 m (6 ft 7 in–9 ft 10 in) tall stem. Plant only male or female subjects, not both at the same time. Otherwise, you can say hello to a crowd of young clumps of these charming invaders. It enjoys a good sunshine. It resists drought even well. Place it in a rather rich soil, fresh but well drained, rather deep. Work the soil to a depth corresponding to a spade. Plant without burying the base of the stems. Tamp rather heavily around the roots. Water abundantly to promote rooting. In the first month, water the seedlings gently. For young plants, water without wetting the foliage. Afterward water during prolonged drought, and for the plants in tray. Cut the dead stubble at the end of winter, to allow the light to reach the new leaves. When two or three years have passed after planting, your pampas can benefit from a tuft division - they become quite cumbersome otherwise! Dig them up completely, cut the stubble and divide them with a spade (or an axe if they are too tough). Then replant them following the normal planting tips.